Set in the rolling landscape of the Sussex High Weald, Bateman’s is a 17th-century manor house surrounded by fields, woodland and ancient hedgerows. With its oak beams and mullioned windows it’s a handsome building, which became the home of novelist Rudyard Kipling from 1902 until his death in 1936. The formal garden close to the house includes a raised path and lawn, which became known as The Quarterdeck [part of a ship’s upper deck near the stern]. Kipling couldn’t join the navy due to his poor eyesight, but in gardening he must have found a rewarding physical release from his written work. There are remnants here of his borders around the edges. In spring the exquisite blooms of Magnolia soulangeana and M. veitchii are joined by flowers of pulmonaria, scilla, hellebores and primroses. Summer-flowering shrubs include exochorda ‘The Bride’ follow, with colourful herbaceous perennials that keep on blooming well into autumn. Wisteria sinensis, with its scented purple cascades of flowers, and the orange and red tubular flowers of Campsis grandiflora (Chinese Trumpet Vine) clothe the walls of the house. Autumn is a fabulous time to see patches of pink-flowered autumn crocus, Colchicum autumnale, dotted about the garden and to appreciate the abundance of the vegetable beds. The orchard is filled with heritage varieties of apples, pears and plums alongside more unusual fruit such as medlar and quince. One of the oldest apple trees, ‘Beauty of Bath’, died in 2014 and had to be removed, but grafts of this tree were taken so that some of its genetic stock can live on. In 1907 Kipling won the Nobel Prize for Literature, the first English-speaking author to do so. Along with the prize came £7,770, which he put to good use at home – creating a lily pond and rose garden. Visitors can still appreciate this tranquil spot, which bursts with fragrance and colour in summer. In his time at Bateman’s Kipling gradually bought up more of the land that surrounded the house. When his widow gave the house and estate to the National Trust in 1939 it totalled a whopping 300 acres. It’s still possible to wander through the wider estate on waymarked paths, and to experience the fabulous Wild Garden (a tennis court in Kipling’s day). This tamed wilderness is now filled with trees such as amelanchier and ornamental cherries and a mass of spring-flowering bulbs that are followed by summer wildflowers and the jungly foliage of gunnera and Darmera peltata. Perhaps the real beauty of Bateman’s lies in the effortless way the garden blends with its rural location. Climb up the steps in the Quarry Garden and you’ll enjoy fabulous views over both garden and the surrounding countryside. It’s here that you’ll appreciate why Kipling loved this place so much. OPEN Daily except 24-25 December. 10am-5pm until 28 October; 10am-4pm until 31 December. Gardens and Estate Manager Len Bernamont shares his experience of Bateman’s. Len works across three National Trust properties in East Sussex: Bateman’s, Bodiam Castle and Monk’s House. He’s worked at Bateman’s for five and a half years and manages a team of two full-time gardeners, one seasonal part-time gardener, an estate ranger and a team of around 25 volunteers. What jobs do you tackle in October? A normal year will see us clearing our annual display from the Mulberry Garden, which is a massive fusion of flower and veg and a highlight of the garden throughout summer and into autumn. There’s tidying up to do in perennial borders and we generally start the process of putting the garden to bed, forking over borders and filling gaps with plants for next year. Do you have any special projects for this winter? We’re putting an extra focus on our spring bulb display, so we’ll start with the first of the narcissi for naturalising before the later cammasia, bluebells, wood anemones and ornamental bulbs go in. The other major project for this autumn is a wholesale refresh of the main borders in the front and formal gardens. We’ll be planting new shrubs and perennials to extend their season of interest. How important is it to maintain the gardens as Kipling planned them? Bateman's is a 17th-century Jacobean house typical of the period, and would have had gardens, possibly including a parterre built into the original design. 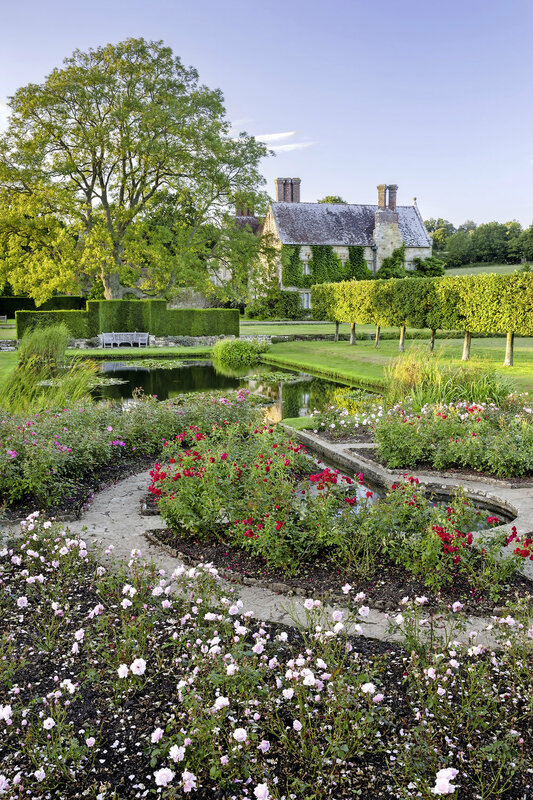 Unfortunately none of this remains, and today the Grade II listing for the garden reflects the significance of this being Rudyard Kipling's garden. The structure, as laid out by Kipling, is still quite intact, but we have very little detail of his original planting plans. Kipling spoke of the garden as being uncluttered and not showy, which presents us with the challenge of staying true to that spirit, while making sure there’s plenty of horticultural interest for visitors. How does this impact on the management of the gardens? We try to source plants that would’ve been available to the Edwardian gardener of the day, but we also take the view that gardens are living, growing things and should be able to evolve. We quite often use cultivars better suited to today’s climate and better able to deal with the growing number of pests and diseases. With an ever-increasing number of visitors, the biggest challenges are meeting the conservation needs of the garden and keeping the garden looking its best all year round. Do you have any of Kipling’s garden plans, notes or photographs? Although it’s less than 100 years since Kipling died we have very few letters or documents relating to the garden. We believe many were destroyed after he died, so all we really have to go on are a few black and white photographs and some tithe and OS maps. We do have a lovely plan sketch Kipling made of the Lily Pond and Rose Garden he designed in 1907, which can be seen in his study, and his poem The Glory of the Garden gives us a glimpse of how Kipling felt about his garden and the work it took to look after it. What makes Bateman’s so special? It’s located in the most beautiful setting of rolling hills and hay meadows grazed by cattle, and it’s managed in a way that means Kipling would still recognise it and the river running through the bottom of the garden beside his beloved watermill. But it’s the sense of peace and tranquillity of what was very much a family home that visitors comment on most when they visit the garden.